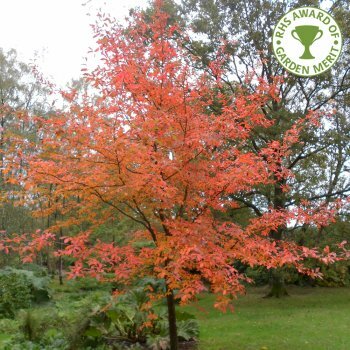 A beautiful ornamental tree with glossy, mid-green foliage that turns striking shades of orange, red and yellow in the autumn. Nyssa sylvatica grows in a symmetrical, conical shape spreading to 5 x 4 metres in 20 years so it never gets too big for most situations. This attractive tree will grow in most well-drained soils in a sheltered position in full or partial sun. The Black Gum tree is definitely a great choice where autumn colour is a must. A lovely choice that rivals Japanese Maples but with greater scale (whilst remaining a small tree) and better suited to damper conditions. Introduced to the Netherlands from eastern North America approximately 1747 and added to many European gardens over the following centuries. Tupelo trees are often found in the wild in wetter areas, even close to streams where the water reflects the spectacular hues of its blazing foliage. It is therefore well suited to moist (but well drained) soils although it will tolerate standing in water for short periods. Nyssa Sylvatica prefers acidic soils including heavy clay but will grow in neutral to slightly alkaline/chalky conditions. On drier soils, keep well watered in dry spells and keep young trees irrigated during establishment. The black gum tree is good in partial shade as well as open situations. It is largely pest and disease free and is low maintenance with little pruning needed on this relatively slow growing tree. When planting Nyssa trees it is important to prepare the planting area well. Pot grown Nyssa trees can be planted at any time of the year. You will need to carry out the following to prepare your planting site. Firstly, remove all weeds and grass within a metre of your desired planting hole then dig a hole as deep as your root mass and approximately 2x as wide. We recommend digging a square hole as this encourages the roots to grow straight as opposed to around, inside the hole. To help your tree establish more effectively, we advise applying root grow (sprinkle in the hole for pot grown trees), especially if you have poor soil. Gently loosen the roots and place into the planting hole. If your soil is poor, mix 50% of the original soil with 50% high quality compost, fill in the hole and firm around gently. Make sure not to bank the soil up around the collar of the tree as this can cause problems. We recommend planting any ornamental tree with a stake and tie, to see how to use a tree stake and tie, watch our informational how to videos. Nyssa trees do not require regular pruning. If you wish to tidy up your Nyssa tree, do this during the dormant season. Focus on removing any damaged, diseased or overcrowded branches. If you require a clear trunk, remove any side shoots to help raise the crown.